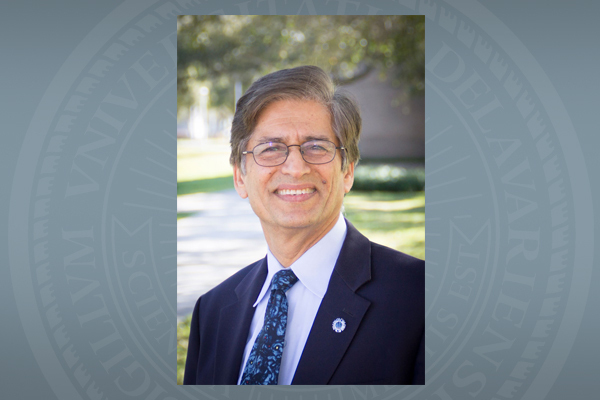 Researcher, entrepreneur and distinguished professor D. Yogi Goswami of the University of South Florida is the 2016 winner of the Karl W. Böer Solar Energy Medal of Merit. 10:56 a.m., March 25, 2016--Renowned researcher, entrepreneur and solar energy expert D. Yogi Goswami of the University of South Florida has been named the 2016 winner of the Karl W. Böer Solar Energy Medal of Merit. The Böer Medal, which comes with a $60,000 award, recognizes an individual who has made significant pioneering contributions in solar energy, wind energy or other forms of renewable energy as an alternate source of energy through research, development or economic enterprise, or to an individual who has made extraordinary, valuable and enduring contributions to the field in other ways. Goswami is the 13th recipient of the medal, which is named in honor of Karl Wolfgang Böer, Distinguished Professor Emeritus of Physics and Solar Energy at UD and founder of the Institute of Energy Conversion (IEC). Since its founding in 1972, IEC has been a leader in photovoltaic research. It is the oldest solar cell institution in the world and is a U.S. Department of Energy-designated University Center of Excellence for Photovoltaic Research and Education. With 18 patents, more than 300 papers and 16 books (authored or edited) to his credit, Goswami brings much practical knowledge to his work as distinguished professor of chemical engineering at the University of South Florida in Tampa, where he also is director of the Clean Energy Research Center. He has received the highest awards of many professional societies, including the International Solar Energy Society (ISE), the American Society of Mechanical Engineers (ASME) and the American Solar Energy Society (ASES) and is a fellow of the National Academy of Inventors, the American Association for the Advancement of Science (AAAS), ASME and ASES. He has served as a consultant for government policymakers and is the editor in chief of the Solar Energy journal and Progress in Solar Energy. Goswami earned his bachelor's degree in mechanical engineering at the University of Delhi, India, and his master's and doctorate at Auburn University. Before joining the faculty at South Florida, he served on the faculties of the University of Florida, North Carolina A&T, and Tuskegee Institute. He also is a visiting professor at the Swiss Federal Institute of Technology in Zurich, Switzerland. "The award selection committee is very enthusiastic about its choice of Dr. Goswami, who is a distinguished scholar in and an important citizen of the clean energy community," said Michael Klein, the executive director of the Karl W. Bӧer Solar Energy Medal of Merit Trust and the Dan Rich Chair of Energy in UD’s Department of Chemical and Biomolecular Engineering. The medal will be awarded later this year. Former U.S. President Jimmy Carter was the first recipient of the Böer Medal, presented in 1993, for his success in promoting development of solar energy technology. The most recent award, made in the spring of 2015, went to Antonio Luque, professor and director of the Institute of Solar Energy at the Technical University of Madrid, Spain, who invented the intermediate band solar cell, raising efficiency limits from 41 percent to 63 percent. The Böer Medal selection committee includes representatives from the International Solar Energy Society, the American Solar Energy Society, the American Institute of Chemical Engineers, the American Physical Society, the American Society of Mechanical Engineers, the Institute of Electrical and Electronic Engineers, the director of the National Renewable Energy Laboratory, the U.S. Dept. of Energy, a Böer family representative, and the executive director of the trust. ¥	2015, Antonio Luque, for inventing the intermediate band solar cell, which raises the efficiency limit from 41 percent to 63 percent. ¥	2013, Zhores I. Alferov and Viacheslav M. Andreev, for their contributions to the investigation and development of semiconductor device technology and physics, which have led to greater performance and efficiency of solar cells and arrays. ¥	2011, Richard M. Swanson, for his innovation in the field of photovoltaics and for his tenure as president of SunPower Corp.
¥	2009, Hermann Scheer, for his long-lasting and worldwide commitment to the dissemination of solar energy. ¥	2007, Lawrence Kazmerski, for his leadership in the field of solar electricity from its infancy. ¥	2005, Yoshihiro Hamakawa, for his significant pioneering contributions to the development of high-efficiency thin-film solar cells and the advancement of solar photovoltaic science and technology as a clean energy source. ¥	2003, Martin A. Green, for his innovative research efforts in the development of high performance crystalline silicon solar cell technology. ¥	2001, Allen M. Barnett, for his pioneering high-performance, thin-crystalline silicon solar cells, and outstanding continuing service to the solar electric power community. ¥	1999, Stanford R. Ovshinsky, for pioneering the science of amorphous semiconductors resulting in the development of low-cost thin-film silicon solar cells. ¥	1997, Adolf Goetzberger, for his leadership in the international solar energy community, his research accomplishments and for founding the eminent Fraunhofer Institute for Solar Energy Systems. ¥	1995, David E. Carlson, for the discovery and commercial development of thin film amorphous silicon cells for converting sunlight to electrical energy. ¥	1993, President Jimmy Carter, for spurring development and focusing world attention on the relatively unknown technology for safe and environmentally sound energy production from the sun.